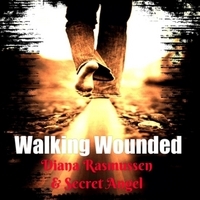 WALKING WOUNDED is a song from a battered woman’s point of view. 1 in 3 women are abused in some way in their lifetime. Diana joins Secret Angel of Secret Angel Ministries in telling their story. Fear sets in, I’ve no place to go. “Walking Wounded”, that’s my name. Scars of abuse, but who’d believe? Behind closed doors, the truth’s exposed. The wounds are real, but he’d deny. And I’m too scared, to testify. Thank you for the poem and the song. Good song come from poetry. The singer had a beautiful voice. Thank you so much. I will let her know. Many blessings to you. Thank you mrsjacoby! God is so good! Thanks Robyn. I am so glad that you liked it. We are praying for a major recording artist to pick it up because all proceeds of that song will go to help victims of abuse. Thank you so much. We are praying that a major recording artist will pick it up and sing it to bring more attention to abuse. We have pledged all proceeds of this song to helping abuse victims. Thanks again and many blessings to you!! Thank you or sharing your song/poem and for bringing awareness to those abused. God is near to the brokenhearted. Thanks Stephen, I am so glad that you liked the song. God is so good. I really appreciate your support. Many blessings to you. Thank you so much for posting our song. May God bless you exceedingly and abundantly!!! Oh my goodness!!!!!!! This is so absolutely AMAZING!!!! Buckets and loads of love to you my soul sister! God bless you! You are right He does see and best of all He does heal! Amen!!! I am so glad that you liked it. Please join us in prayer that a famous artist will record it one day with proceeds to go to safe houses for abuse victims.. God bless you, my sister! You didn’t even have to ask! My prayers are always with you sister! God bless you too!!!!! Sis, I told you in my comments on “Rage” I would be listening to this song next. Oh my, oh my! It brought me to tears! I am 62 year old man who has lived and I can still cry! Oh Sis, I meant everything I said in my comments on the Rage article. Your ministry is needed in a church world that wants to ignore this serious issue and the Holy Spirit has definitely anointed you to this. That song was SO powerful and awesome!! The words, the tone of Diana’s voice, the melody, it was ALL so inspiring. I am going to my Facebook page and going to put this link on their for anyone and everyone to see!! What an awesome and needed ministry!! The thought that comes to mind is something I heard on a movie, “I am Gob-smacked! !” Don’t know what it means, but sure seems to fit what that song done to my heart! Again, God bless you (and Diana) so richly, so abundantly. You and your ministry are in my wife’s and my prayers!! Your words have just melted my heart!! God is so good! I praise God for what He is doing. I was driving down the road one day when this song began singing in my head and I wrote down the words. I know that God has plans for His song as He gave me the words then brought Diana, another overcomer of abuse, to write the music for it… He definitely has a plan and I just walk in faith that His will for our song will come to pass. I really appreciate your support more than you realize! God bless you! It was beautiful….and echo’d my life….the scars not visible and run very deep. Still there is hope – one day, one footstep at a time. Thank you so much and yes, there is Hope! He is our Key. So many of our lives have been wounded by various things that have happened… But God heals and restores. All we can do is hold onto Him and take it one day at a time as He leads. The trouble with abuse is the shame of the victim… when there is no reason. And you are correct, God heals. I read an inspiring book on God’s healing of emotional abuse by Susan Scott. I am sure she would identify with this and be surprised to know that she is not alone! Thanks Susan! Too many still do not even realize the destructive force behind the words spoken in verbal and emotional abuse. The power of the spoken word is very real. Thanks for sharing. I will have to check out her book! God bless you! And so many people think that when physical, or sexual abuse is over, that’s it. No. With every form of abuse there is emotional repercussions! Penalties the victim carries and lives with. Amen!! That is right. And so many carry their wounds with them, hidden from the eyes of man, but negatively affecting their lives. Words hurt more than people realize. Amen-Amein Sister’s in Christ Jesus-Yeshua Secret Angel and Diana, God Bless you Sisters and your Family members and Friends!! Awe!! Thank you so much Kristi Ann!! I am so excited that you liked our song. God gave it to me on day then brought Diana by Divine connection to write the music for the lyrics. We serve an awesome God!!! !